What an awesome hunt with Jaric on Friday! A father/ son hunt on a frigid winter day! Jay Eric and his son Jaric arrived early, and they headed to the ranch, arriving at the blind at daybreak. We seen a few deer roaming, but they were out at 150 yards or more, and we wanted Jaric to get some better views if possible. 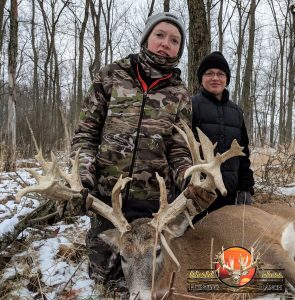 My son Brian and I joined Rich and the hunters on this one day hunt, and about mid forenoon, with the frigid temperatures, the deer still weren’t moving a whole lot. so Richard asked if I would maybe go on a walk, and see if I could see where they were hiding. 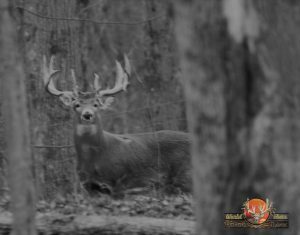 Again, the heater in the blind was a great asset, as you can understand with 5 degrees and a moderate breeze, you won’t maintain a long wait on a whitetail without something to keep you from freezing! Brian and Jaric carried on with some conversation while I started into the cold! After an hour or so, I got on the Ranger and drove around for a while, and then headed to the blind to go after some grub. When I arrived at the blind, Rich come walking out with his backpack and put it on the Ranger, then Brian comes out all excited and says Jaric made a great shot! 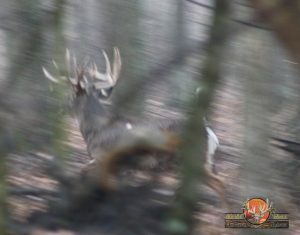 The buck is laying right over there! I said what!? So, here there were some deer that came by the blind, and I didn’t hear the shot of the .257 Roberts, as Jaric made an awesome shot! 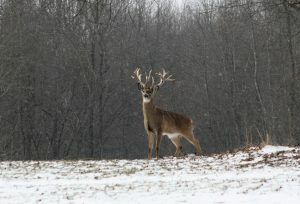 And what a buck! 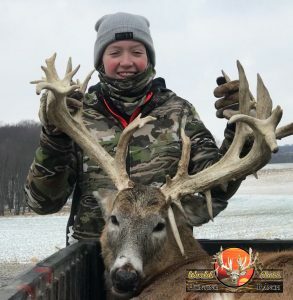 Congratulations Jaric on an Awesome 230″ Whitetail Trophy!